Nothing makes a flight or space sim really sing like a hands-on throttle and stick (HOTAS) setup. Thrustmaster’s $200 T.1600M FCS Flight Pack combines joystick, throttle and rudder pedals in one lovely entry-level package. Between the rise of virtual reality and an expanding audience of people with incredibly good taste in game genres, space sims and flight sims are experiencing a renaissance. Games like Elite: Dangerous and Star Citizen are getting people flying, and from there it’s a short hop to more realistic stuff like Digital Combat Simulator World. But first the new players need to trade their game pads for something a bit more appropriate. They need joysticks with triggers and hat switches. They need a throttle. They don’t necessarily need rudder pedals, but if you’re going in you might as well go all-in. That’s what the Thrustmaster T.16000M FCS Flight Pack is all about. 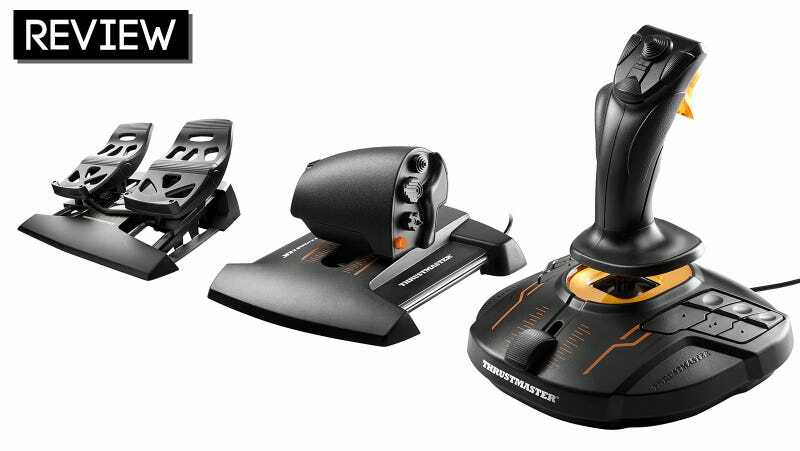 The T.16000M FCS Flight pack is a complete HOTAS setup for PC, comprised of three parts. At the heart of the package is a slight retooling of Thrustmaster’s popular T.16000M flight stick, one of the more popular starter sticks on the market. The T.16000M utilizes Thrustmaster’s Hall Effect Accurate Technology (H.E.A.R.T. ), utilizing magnetic sensors in the stick to heighten accuracy, smooth movement and reduce wear. Along with an orange redeco (the original has a green thing going on), the new T.1600M features raised bumps on the 12 buttons located on the unit’s base, making it easier to know what you’re pushing when you’re sporting a virtual reality headset. Along with those base buttons, the T.1600M features its own throttle switch, three buttons and a four-way POV hat up top, as well as the obligatory trigger. The stick not only moves in all the ways one expects a stick to move, it can also be twisted left and right, rolling or turning your craft of choice depending on your configuration. The T.16000M is an ambidextrous flight stick, packed with plastic pieces to move the hand rest from the right side to the left. The second part of the set is the Thrustmaster Weapon Control System (TWCS) Throttle, which gets its own special acronym tech—Sliding Motion Advanced Rail Tracks (S.M.A.R.T.). Rather than pivot on an axis like most throttle controls, the TWCS slides smoothly back and forth on a pair of rails. The TWCS sports 14 buttons, a POV hat switch, a scroll dial, a mini analog stick and a toggle rudder. Together with the T.1600M stick, that’s 30 different buttons, two 8-way POV switches and 9 control axes. Might as well add three more. Finally we have the Thrustmaster T.Flight Rudder Pedals (TFRP), a pair of differential pedals featuring the same smooth S.M.A.R.T. motion as the TWCS throttle. The pedals feature removable heel rests, allowing for multiple ergonomic layouts. It bears noting that each of these components can be purchased separately. I’ve seen the pedals and throttle for around $80 and the stick for $60, so if one would rather start with the stick and add the additional components as they go, they’ll only be paying $20 more than the full bundle. For one, I played a lot more Elite: Dangerous than I ever expected to. It’s a game I dabbled with using Xbox One and virtual reality controllers that didn’t quite click until I got my hands on Thrustmaster’s HOTAS setup. It helped that the game had a controller setting all ready for it. I also tooled around with the perpetually-growing Star Citizen, another game for which the Flight Pack feels as if it were custom made. Outside of my comfort zone, I fooled around with Digital Combat Simulator World, at least long enough to realize I am not ready for Digital Combat Simulator World, but will be well-prepared when I am. I also mucked about in Mechwarrior Online, which took me right back to my mid-90s flight stick glory days. While several of the games I played worked with most of the Flight Pack out of the box, some required advanced remapping and tweaking. For that I turned to the Thrustmaster Advanced pRogramming Graphical EdiTor (T.A.R.G.E.T.). It’s a very versatile tool that’s probably very useful in the hands of a seasoned scripter. I was able to poke about enough to get the right buttons doing the right things. I also adjusted the Razer Chroma of my keyboard to match the orange glow, because something is wrong with me. The Stick: An excellent flight stick and a very good price, the T.16000M does quite well on its own, without help from a throttle and pedals. As a standalone unit, its throttle dial is just a thumb-flick away and its 12 base buttons (six on either side of the stick) make a lot more sense. The magnetic action is smooth and satisfying, losing none of its feel after weeks of regular use. The buttons on top of the stick could be tighter, but that’s something I don’t notice as much in the heat of battle. Slide-Action Throttle: Some people prefer a lever-based throttle that follows a curve from a central point at the base. I am not one of those people. Perhaps it’s because I am primarily into space sims, and the motion of a throttle moving back and forth on rails feels more futuristic. Whatever the case, the TWCS throttle has me covered. Every time I throttle up all the way, I imagine someone telling me to punch it. Oh, I punch it. Being a rail-based throttle, the TWCS maintains a lower profile than lever-based units, which I find much more comfortable during extended sessions. So Many Buttons: I always feel mildly ridiculous when I am playing a space or flight sim with a controller than isn’t bristling with buttons. My virtual self is sitting in front of an endlessly complex control panel of some sort, and I am pressing the A button, maybe holding down a shoulder button for good measure. Nonsense. With the T. 16000M and TWCS combined, I have 30 buttons at my disposal. Not all of them are within easy reach (more on that in the other section), but all of them are quick and responsive, and all of them can be remapped to my personal preference. I Don’t Need Pedals, But These Are Nice Pedals: Being a more basic space and flight sim user, I am perfectly fine with the rudder paddles on the TWCS Throttle or, in a pinch, the T.16000M’s stick twist. It’s a next step I’m not quite ready to take. That said, even with my size 14 feet, the T.Flight Rudder Pedals are pretty smooth and comfortable. Enough so that I am pondering working on my differential braking. It’s a process. Sticking Together: My main issue with the T.16000M FCS Flight Pack is that the T.16000M stick and TWCS throttle are a bit clumsy together. Specifically those 12 base buttons on the flight stick. They’re easily accessible enough while using the stick by itself, but with one hand on the stick and another on the throttle, having to hit one of the base buttons is awkward. How many times am I going to deploy my landing gear instead of my hardpoints? All the times, at least until I give up and remap the control somewhere else. Throttle Crowding: The TWCS throttle packs a lot of buttons in a small space. While I had no problems accessing the thumb controls on the side of the unit with my oversized hands, positioning my fingers on the buttons on the front side of the throttle often led to me accidentally hitting the rudder paddles. Slightly Off T.A.R.G.E.T. : The T.A.R.G.E.T. configuration software that Thrustmaster offers for download to create custom profiles for the T.16000M Flight Pack is deep and detailed, but it’s not very new-user friendly. It could really use a built-in tutorial or at the very least some tool tips. If you’re looking to take your flight or space sim game to the next level, the Thrustmaster T.16000M Flight Pack is a fine way to do so without breaking the bank. It’s a lot of flight controls for $200, and it despite a few clumsy buttons it should keep you going until you’re ready to step things up a notch.